Twigg - Peeping through the branches of an old Oak. 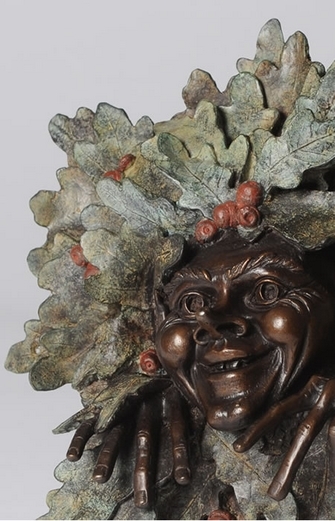 A beautifully made bronze Goblin wall plaque, by renowned sculptor Julian Jeffery. With an attention to detail which almost brings them to life. Cast in solid bronze, and each one bearing the artist's signature, to create something which not only looks superb, but will last a lifetime. Twigg is the creation of the sculptor Julian Jeffery. Julian Jeffery was born in Staffordshire in 1973 and trained to be a stonemason with Staffordshire Stone. In 1993 Julian was accepted at Stafford College to study figurative sculpture, where he was renowned for his creative flair and eye for detail. Upon graduation, Julian was commissioned to create a range of private commissions, starting in 1997 with the life and a half bronze of Sir Stanley Matthews. Since then his work has diversified with a range of limited editions and the well-known Hoblins collection. Julian is currently designing several private commission pieces as well as developing a new member for the hoblin family. Watch this space!